Particularly during a nonprofit’s growth periods, its finance team may be asked to generate reports on the health of the organization at any given moment. And, although most manage and prepare reports quarterly, bi-annually, and annually, the preference is to have the ability to provide reports based on current state. How can you be ready when the ask comes your way? 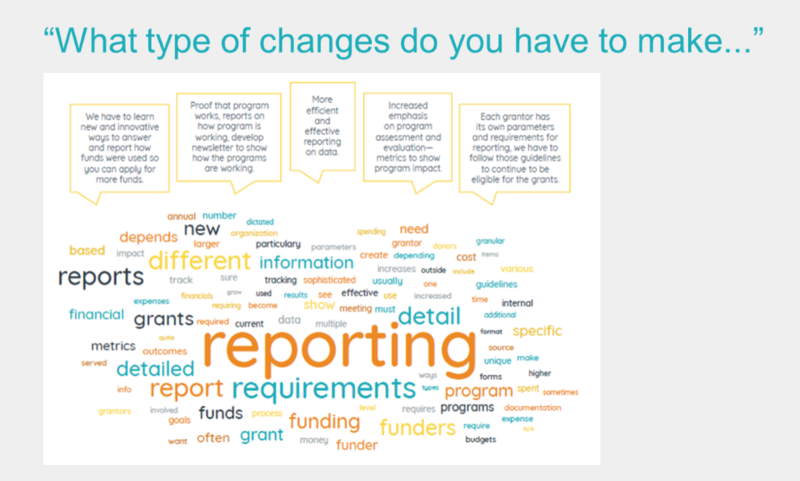 You can see from the keyword cloud, there are many types of changes getting incorporated to respond to funders during growth periods, even when reporting requirements may be different by funder and/or by grant. Users need more efficient and effective reporting on data. A good place to start is to increase emphasis on program assessment and evaluation – capture metrics to show program impact. As you increase services, your chart of accounts grows with you. Add the codes you need and budget for those new services. Growth is planned – that means strategically planning. Use a good a budgeting tool to include money for new services and use that to determine the new funding needed to support the plan. Producing accurate reports to convey transparency with your finances inspires confidence, which is the foundation to maintain funding. For careful planning for staffing growth, leverage an employee management tool or module, connected to your accounting software to enable efficient management of new employee requirements. Finally, for quick access to your financials and reporting (for example, anywhere, anytime login), seek out a cloud solution for your accounting system. Create general ledger (GL) groups for payroll tax analysis or benefits analysis. Set up groups by budget manager or set up groups by managers and department for easier reporting. Manage reports with executive view licenses. These license types allow additional users to run their own reports and assist with budget preparation, freeing you to focus on your management tasks. At the end of the day, reporting should not be painful or burdensome. With an automated solution, you can replace that stress with ease. If you have interest in learning more from your nonprofit finance peers, we invite you to contact us below for a download of the full study, “Nonprofit Finance Study: The Dynamics and Challenges of Growth,” and take a deeper look.